We had a new 40 coin submission in to VSS and those coins were added to the web site in late December. In the group were two VAM 5 - O/O, Doubled Right 1; one VAM 1D - Flaky Eye; and two VAM 27 - Doubled Ear coins. So this is a nice batch for adding to the most desirable VAMs. Also included in this group were two Poor 01 and one About Good 03 coins. We knew that VAMing them would be a long shot, but we tried. But with the addition of the two Poor 01 coins we now hold 60% of that PCGS graded group. You can see the whole submission by clicking here. ​ In late October we finished up raw coins for a bulk submission by VSS to PCGS. We were not expecting that submission to come back until January, but in mid December it showed up. Of the 100 coins submitted, 74 graded. We submitted several coins that we thought were on the edge of grading so the success ratio was pretty good. The coins returned from VSS just before Christmas and will be posted as soon as the images arrive. There are a few in this group we will be sending to LVA for analysis, so hopefully we will start off 2017 with a new discovery or two. Sometimes we swear that there is collusion in the market when we start looking for a particular VAM. As noted above we are working to expand our VAM 5 inventory. But no sooner that we started working on that VAM, the raw coins dry up. We also swear that coins seem to come in spurts. We will see many clashed coins at once and then they dry up. Then in the latter part of November and early December several VAM 1D coins suddenly appeared on eBay, all circulated at various grades. Then there was a PCGS graded one on Great Collections and another on Heritage. Maybe VAMs somehow flock together? Whatever the reason they are in season, so while we wait for VAM 5 coins, we are scooping up VAM 1Ds. See our notes on the right for more on the 1D. Working through VSS and the discoverer of two new VAMs, 24.2 and 71, we were able to acquire the two discovery coins and add them to our collection. It is great to have others working on this narrow project and continues to illustrate the value of our approach. The two VAMs are a Die 2 for preexisting VAM 24 - Doubled Second 1. The original VAM 24 Die 1 discovery is credited to Martin Field in 1982. This new die is credited to Jim Longe. The second is a new VAM 71 - Doubled 18-1, Legend, and Left Wreath and this new VAM is also credited to Jim Longe. Both of these coins were in the VSS batch mentioned above and we now have the images and they have been posted to the web site and at VAMworld. 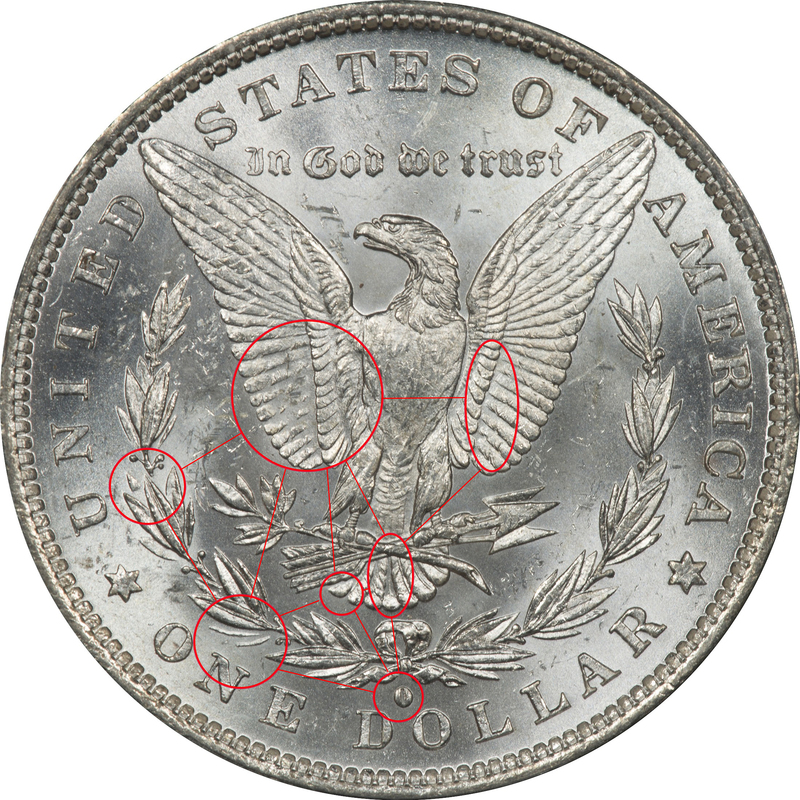 You can read more about these two VAMs in the right hand column, but these are becoming the Holy Grail of the 1881-O series. If you remember the movie City Slickers and Jack Palance's role as Curly, then you might remember his note about the secret of life. According to Curly you have to remember that "The main thing is to remember to keep the main thing the main thing." We have no interest in taking credit for the find. The "main thing" is to find them. So in the spirit of good old Curly we are going to offer a prize of $100 to find either or both of these two VAMs. So if you happen to run into one at a show or on-line please keep this challenge in mind. Since lack of documentation is an issue for these two we will work with VSS to have them labeled and photographed. We are almost there, and with the addition of the coins in the bulk submission we will cross the next inventory milestone. You can see at the top of this page that our inventory count is at 599 and that is far beyond where we thought we would be when we started this venture. But with help from several friends and experts we have cornered at least one example of 88% of the 1881-O series. Hopefully 2017 will lead to even more discoveries and filling a few more of those final gaps. We annually do an analysis of PCGS stated values and finished it up early this year. The comparison between 2016 and 2015 populations, prices, and values can be accessed by clicking here. There has been a good deal of conversation on the VAMworld message board about the softness of prices in the world of coins. But our analysis would indicate that at least for the 1881-O this is not true. We don't think there has been any appreciation, but neither has there been any degradation of prices in the aggregate. For the year the number of graded coins increased by 6% and the aggregate value of all graded coins increased by 5.9%. One might want to argue about the accuracy of pricing, but this is always a bone of contention. Assuming that PCGS used the same pricing criteria in 2015 and 2016, then this argument would not seem to "hold water." Like it or not; believe it or not; values seem to have stayed stable so far as we can tell. As we close in on a full set of VAMs for the 1881-O our need to stay in some reasonable price range becomes obvious from this chart. Like the PCGS inventory at large, our "sweet spot" is in the MS62 and MS63 range where there is good detail and reasonable prices. We also set a goal for ourselves of maintaining an inventory of 1% of the PCGS graded coins at each grade, and we are on track to meet that objective. The bulk submission in the works now will skew these figures toward the AU rated coins, but will not hurt our overall goals. Well the stats are in for 2016 and we like what we have seen. Our objective is to promote VAMing and in some small way we think we are at least making a dent. Our thanks to all who have visited and for the positive comments. So as to the data this is what happened. Here in the United States we received at least one visit from every state. Activity was focused more in the South (Georgia, Texas, and North Carolina) and far West (California and Washington). But there was also good activity in the Mid-west. There were 2,294 unique visitors who visited a total of 9,212 times. But more importantly for us is that they viewed 438,154 images. So there is excellent evidence that our VSS images are a significant resource for those who visit. Worldwide the information is encouraging, but we are always a little suspect of the traffic from a few places. Setting aside that bias, there were visits from 93 different countries, excluding the United States. Outside the US there were another 2,080 visitors who stopped by a total of 7,081 times. From outside the US there were 76,699 image views. Logically the main interest in US coinage and VAMing should be here in the United States, but there is interest in other places. And we are sure some people just stumble across the site and scratch their heads. But sometimes that is now people get interested and plugged into a hobby. In doing our analysis of pricing and certification for 2016 we discovered we had slipped up and missed an event. Sometime in the latter part of the year PCGS certified the first 1881-O MS65+DMPL. The price was slotted at $18,000 so needless to say we will not be adding that one unless we win the lottery. But it is nice to see someone hit a home run and found a new one in that grade.